While the U.S. Coast Guard oversees all responses to oil spills and chemical accidents in U.S. navigable waters, NOAA's Office of Response and Restoration (OR&R) provides them with the science-based expertise and support they need to make informed decisions during these emergency responses. For the oceanographers and computer programmers at OR&R, the work of responding to an oil spill begins long before any tanker or barge ever leaves port. During a spill, our response team relies on computer models and other electronic tools that we have already designed and built. Oceanographers use information from one of these models to forecast the trajectory of spilled oil. That is, they use the model to predict where spilled oil will likely go and how fast it will travel. The animation here shows our model's prediction of how the oil spilled from the tanker Exxon Valdez would travel across Prince William Sound, Alaska, from the start of the spill on March 24, 1989 through May 1, 1989. 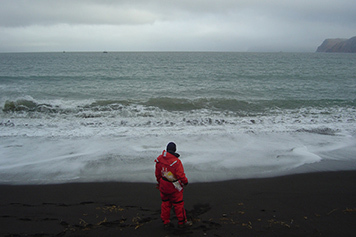 For significant oil spills, specialists from OR&R typically travel to the incident site to provide on-scene support. One important task they conduct is aerial surveillance of oil. Overflight specialists fly over the area of the spill in either helicopters or airplanes to survey the spill scene, estimate the extent of any oil slick that has formed, and track the movement of the spilled oil. Information from these aerial surveys, known as overflights, is used in our trajectory computer model to "ground truth" the accuracy of the model and improve future predictions of the path of the spilled oil. During overflights, our spill specialists note the locations where they've observed different types of oil, places where the shoreline has been affected, oceanographic features that affect the movement of oil, and other information the response team needs. They record this information in photographs and overflight maps of the area surveyed.